At this time of year, researchers, doctors, and recreational nerds alike turn to the American Association for the Advancement of Science (AAAS) for the list of the past year’s most important scientific breakthroughs . 2015 saw many significant advances that gained flashy and well-deserved press. The world witnessed the creation of an Ebola vaccine, the first fly-by of Pluto, and the discovery of a new human subspecies, Homo naledi. However, one critical breakthrough received far less press: the discovery of lymphatic vessels in the brain. Oh, you didn’t hear about that? Well, that’s probably just what these stealthy vessels would have wanted! The discovery of brain lymphatics (Figure 1) will open many new doors to understanding the brain, but it is also remarkable simply because there is so little about the human anatomy that has not yet been mapped. Indeed, because of these vessels’ hidden location deep within the brain and their close proximity to prominent blood vessels, brain lymphatics had legitimately escaped the notice of the biomedical community. That is, until now. To back up, what are lymphatic vessels? Lymphatics are like the highways of the immune system and are found throughout the body. They orchestrate immune surveillance of various bodily tissues so that specific immune responses can unfold in the body parts that need them. Lymphatics are similar to blood vessels, but they carry immune cells in a fluid called lymph. Lymph is the collection, or “drainage,” of non-blood fluids that are found in tissues or organs. Like tiny streams converging, this fluid collects and is channeled into the network of lymphatic vessels, passes through lymph nodes, and makes its way back to the bloodstream. When a tissue is infected by a pathogen, like a virus, bacteria, or parasite, bits and pieces of the offending pathogen end up in the lymph. These pieces, along with immune cells from the infected tissue, reach the lymph node, and the cells in the lymph node then react to coordinate a specific immune response to the pathogen. Thus, the system not only allows for recirculation of bodily fluid, but it also provides a means for the immune system to sift through material from around the body in order to scan for infection. Without lymphatics, fluid would build up in body tissues, and there would be no way to alert the adaptive immune system to invading pathogens. The brain is considered an immune-privileged site, meaning it doesn’t play by typical immune system rules. Compared to most other tissues, it has tighter barrier membranes separating, which restricts movement of cells and material into and out of the brain’s parenchyma (the meat of the brain where neurons reside). Thus, immune cells from inside the brain can’t travel to the lymph nodes to initiate an immune response the way they would in other tissues like the lungs, skin, or gut. The result is that normal immune reactions within the brain are rare. Immune privilege likely exists because an overzealous immune response can act as a double-edged sword. The immune system is important for maintaining healthy tissues, fighting off bugs, and cleaning up after injury, but too much activation can be severely damaging. T cells are a common subset of immune cells that are particularly important when it comes to offing viruses or bacteria. They are constantly on the lookout for invaders, and they can be cytotoxic (cell-killing), so they find and eliminate infected cells. Autoimmune diseases like type I diabetes (T1D) or rheumatoid arthritis (RA) are examples of conditions caused by problematic immune responses, wherein the immune system mistakes a bit of self for a bit of invader and wreaks havoc on the tissue where that bit is found—the pancreas in T1D, and joints in RA. The immune system can also cause damage when it’s doing its job right. Attacking an invading bug often comes at the cost of collateral damage to surrounding tissue, which must later be repaired. Thus, restricting immune system access to our most important tissue sites is a mode of self-preservation, especially for those sites that cannot easily repair after hosting a battle. Neurons do not regenerate in adults the way most other cells do, making them difficult to replace or repair if they’re damaged by a traumatic event like an immune response. This is likely the evolutionary reason for restricting immune access to the brain, and it’s the reason why immune responses in the brain can be so devastating when they do occur. For a long time, scientists thought that the brain had a totally autonomous system of immune defense based on brain-compatible immune cells called microglia, which live inside the parenchyma and never come and go the way a normal immune cell would. Some other types of immune cells—ones that are great at capturing and exposing elements of pathogens—survey the brain for infections not by going into the brain, but by monitoring it from the outside. These cells sample material from the brain that gets into the cerebrospinal fluid (or CSF, the fluid that surrounds the brain and spinal cord). They show what they find to T cells, which circulate around the outside of the brain looking for signs of trouble, but typically stay within the CSF. If there is no sign of infection, the T cells continue on their way. If they see evidence of a problem, they can be triggered to enter the parenchyma (Figure 2). Because of the brain’s immune privilege, the lack of evidence for brain lymphatics was rarely called into question. It was believed that CSF could play the part of the lymphatic system in the brain . Even so, conceptions of how CSF allowed information to be passed from the brain to the lymph nodes had been fuzzy at best. The proposed model entailed CSF first draining through nasal mucosa—that’s right, snot!—and joining up again with lymphatics in the head and neck to ultimately channel through lymph nodes . However, the discovery of brain lymphatics points to a far simpler route. Figure 2: Immune surveillance in the CNS. Immune cells (pink) surveying the CSF present what they see to circulating T cells (purple). Lymphatics (green) provide a route for CSF and circulating immune cells to reach lymph nodes in the neck and return to the rest of the body. In a healthy brain (left), T cells don’t see a problem and circulate back to the rest of the body. In a diseased brain (right), the T are alerted to infection and respond by infiltrating the parenchyma, which can cause immune-mediated damage. (Cells not to scale). Brain lymphatics: immune privilege redefined? This past year, researchers at the University of Virginia (UVA) led by Jonathan Kipnis and Antoine Louveau were analyzing the brains of healthy mice, and happened upon what looked like well-organized immune cells—specifically T cells—throughout brain tissue . They weren’t roaming willy-nilly through the tissue; something was confining them. After looking more closely, they identified lymphatic vessels in the brain, draining CSF and its contents into the neck’s lymphatics and to the lymph nodes below [3, 4]. Independently, a group of researchers in Switzerland, led by Kari Alitalo and Aleksanteri Aspelund, made the same discovery , making it highly unlikely that the finding is a fluke. Why hadn’t this been seen before? The sophisticated imaging technology the researchers used had never before been applied to this task. Their study involved looking at large, intact brain samples from mice, as well as monitoring live mouse brains. In both cases, the teams specifically labeled the brain’s structures and cells with differently colored fluorescent tags. For example, T cells might be tagged with red fluorescence, blood vessels with green, and so on. This strategy allowed them to visualize these lymphatic systems by fluorescent microscopy . Discovering a new body part in the 21st century is in itself remarkable, and the scientific significance of this finding is equally extraordinary. While it doesn’t necessarily upend ideas of the brain’s immune privilege, it demonstrates a specific connection between the brain and the immune system—one that was previously thought to be nonexistent—and indicates that these two systems may be far more intertwined than previously believed. The specific implications of this finding are still unresolved, but it is now thought that defects in lymphatics could factor into diseases where immune dysfunction harms the brain, like Multiple Sclerosis and Alzheimer’s [4, 2]. 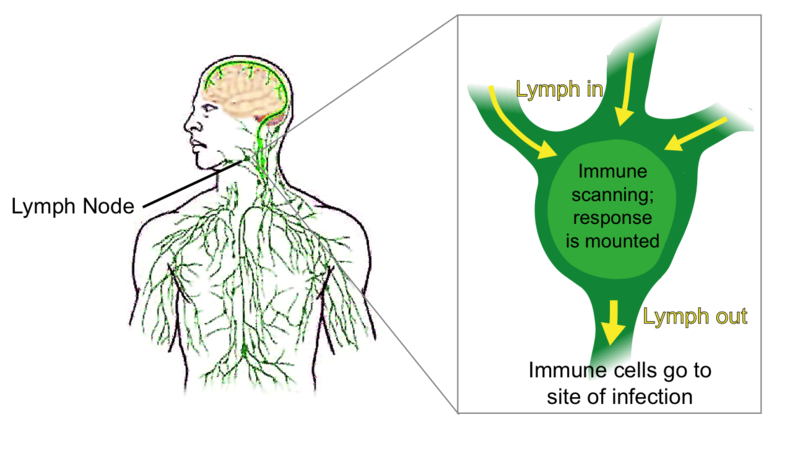 In healthy individuals, it’s likely that the immune system uses brain lymphatics for immune surveillance. 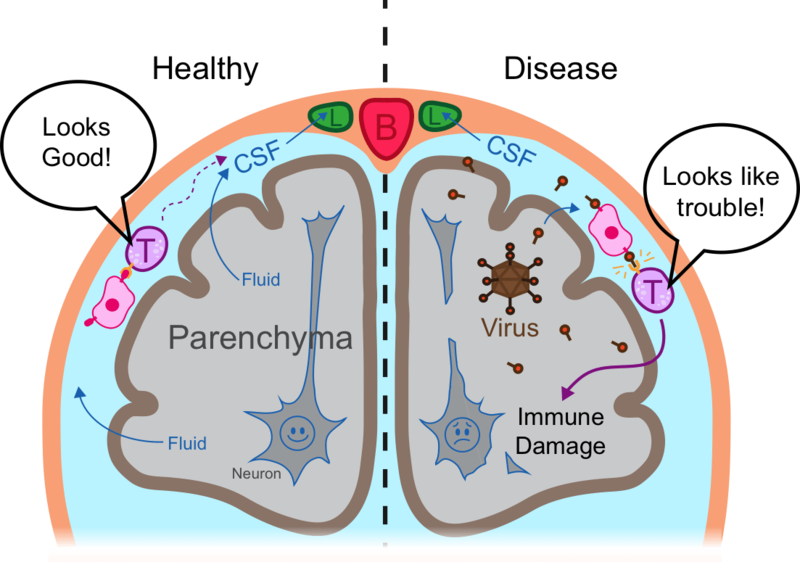 While the brain’s microglia still cannot exit the parenchyma, cells in the CSF and lymphatics could shuttle information back to nearby lymph nodes via the lymphatic vessels (Figure 2). They would thus be able to efficiently communicate immunological messages about the brain in an “outgoing” direction without disrupting the barriers that keep the brain safe—although all of this remains to be verified. Could immune access to the brain be important for reasons beyond host defense? A related and equally intriguing idea is that the immune cells that survey the brain from the outside, like those in the lymphatics, are communicating messages to brain cells in an “incoming” direction. They could be passing along information about what is going on in the peripheral immune system. Additionally, recent studies suggest that the incoming messages could somehow influence cognitive functions . A hint at a role for immune cells in neurological health comes from the observation that cognitive functions can be sharp or dull depending on the status of the immune system—whether it is fully competent or compromised. This relationship has been explored by researchers examining cognitive function in healthy versus immunocompromised mice. The healthy mice can easily fight off typical infections, and they behave like any normal mouse would in cognitive tests involving mazes and other stimuli. The immunocompromised mice, which don’t have T cells, get significantly lower scores on the same cognitive tests given to the healthy mice. Researchers uncovered evidence that the immune systems of the mice may be directly responsible for these behavioral differences. They demonstrated this by using bone marrow transfers to swap the immune systems of the two types of mice. The findings were striking: the typical cognitive defects seen in immunocompromised mice were remedied by receiving healthy marrow. Conversely, the healthy mice receiving immunocompromised bone marrow started to behave more poorly in the tests . How could the immune system be affecting cognition? Among many possible explanations, some scientists speculate that T cells and brain-resident microglia are responsible for these cognitive effects—that T cells just outside the brain could be communicating with brain-resident microglia and orchestrating their behavior, and that microglia could in turn affect neuronal signaling. This is plausible because microglia are not only in charge of fighting pathogens in the brain, but also play a role in brain homeostasis, meaning they keep everything in line day-to-day. Microglial cells clean up debris from old cells that die or from occasional erroneous cellular processes, which aren’t necessarily pathogenic. They also help refine connections between neurons in the brain, keeping signals sharp and specific. The theory is that T cells outside the brain signal to the microglia to perform these duties. Without the T cells, microglia might be dysfunctional, leading to a build-up of debris or connections that go haywire, ultimately disrupting proper cognitive function. Another possibility is that systemic or local levels of chemicals produced by a normal immune system, but not by a weakened one, influence the chemical context of the brain. This could affect the cognitive functions of mice by influencing any of the diverse cells in the brain, even the neurons themselves. Whether the lymphatic-bound T cells, like the ones observed by the researchers at UVA, are actively promoting the cognitive wellbeing of mice or humans remains to be proven. However, the immune system is clearly involved. With these findings, and with the discovery of the brain’s lymphatics, the picture of neuroimmune interactions continues to develop. Brain lymphatics show that the nervous system is using the typical structures and tools of the classical immune system, meaning we’ve been wrong about some basic ways in which the brain and immune system are connected. It is not yet clear whether lymphatics and cognition are part of the same neuroimmunology story, but these two examples demonstrate that communication between the brain and the immune system is a two-way street, and powerful in ways that the scientists of yesterday might have never anticipated. It seems that it’s high time to welcome the brain back from its pedestal of separation from the immune system, and start a new conversation about how studying neuroimmune interactions could begin to address a multitude of problems in neurological function and disease. Marie Siwicki is a first year graduate student in Harvard’s PhD program in Immunology and is currently studying how neurons in the intestines interact with the immune system. For more information on AAAS’s list of top scientific breakthroughs of 2015, see: Runners Up. Science, 18 December 2015: Vol. 350 no. 6267 pp. 1458-1463. Ransohoff, R.M. and B. Englehardt. The anatomical and cellular basis of immune surveillance in the central nervous system. Nat Rev Immunol, September 2012: vol. 12 no. 9, pp. 623-35. Kipnis, J., N.C. Derecki, C. Yang, and H. Scrable. Immunity and cognition: what do age-related dementia, HIV-dementia and ‘chemo-brain’ have in common? Trends in Immunology, October 2008: Vol. 29 No. 10. It’s amazing that we continue to discover new things about the world, life, and even ourselves as a species. With this specific discovery, it makes me wonder how many brain chemistry altering drugs may also be affecting our immune system, potentially permanently. Is that at all possible, given this discovery? Biology is not my strongest field, but it is always interesting. So, if textbooks need to be rewritten, would that not mean in general and also in regard to vaccines where theory and methodology have been developed in ignorance of this reality? What is done to the immune system clearly impacts the brain and with Autism rates at astronomical levels, from one in 10,000 in 1983 to one in 150 today, following huge increases in vaccinations and at earlier and earlier ages, and in experimental multiple form etc., and Behavioural and Learning Difficulties in children at levels never previously seen, not forgetting that Brain Cancer is now the biggest Cancer killer of children and young people, surely this new information should be writing vaccine theory textbooks first of all? There is no clear cut cause of Autism however it is hard to overlook to sudden and even delayed onset of autism and like conditions/syndromes with the administration of vaccines. There is no doubt we and our children are exposed to more toxins than ever before. And children are getting these toxins earlier, in additional forms and in heavier doses than their parents did. And evidence of gene damage carry over from previous generations and you have a recipe for a neuro- immunologic crash. We need to clean up our environment and the toxins delivered through our food supply. Pesticides, insecticides, heavy metals , and GMO foods are not our friends. If we do not excise these factors we will never solve the problem. Like I said before, there is NO evidence that vaccines cause autism. Or GMOs. Yes, there is evidence of pesticides causing health effects (but not autism or neuroimmunologic symptoms), and we have written about that here. There are also neurological effects of lead exposure in children, but this is due to toxicity, not an immune response. A precautionary principle should have governed us putting these chemicals into our food and water, and our air. Now there is harmful chemicals even in remote places where no people live or have even visited, such as the bottom of the sea. If we do not stop and clean up our act nothing else will matter. We will have a generation of sick children in need of medical and social care and special education. And less people to take care of them or make scientific progress to clean up the toxic burden. I am not a doomsday type of person, but toxic chemicals in food water and air, is that really a good idea? Clearly not. You could ask a child that question. I find it very interesting that “holistic” or “metaphysical” practitioners, along with practitioners of ancient arts such as Traditional Chinese Medicine and Ayurveda (which cured people for thousands of years before “modern science” was even on the horizon) have always considered there to be a strong relationship between the brain, the mind, and the many systems of the body, in very particular ways. All of these systems and practitioners view a deep relationship with things we put in our bodies, and our health as a consequence of that. There are many links and relationships within the body that are common knowledge in these arts, but science will ever believe they have just discovered a never-before-seen aspect of the body because they can “validate” it with their specific case studies. SITN will continue to reply to each comment here that there is currently no connection between autism and vaccines, or GMOs, or pesticides. But they would have told us just a couple of years ago that there is no known physical connection between the brain and lymphatic system… Just because it hasn’t been confirmed yet, doesn’t mean that every single aspect of our environment (food, air, particles, relationships) doesn’t have a direct effect on our bodies. It does. The great thing about science is that it allows for a change in beliefs based on the most recent data! Science is not about faith in an idea, it’s about trying to come as close to finding truth as we can–if someone can come closer to the truth later, then great; we all change our minds. This type of scientific thinking can also be applied outside of science (have you ever watched politicians on the news ignoring facts?). Some ancient beliefs (e.g. the word is flat, the Earth is the center of the universe, spontaneous generation) have been disproven by science despite there being what seemed like evidence for them at the time. And now it seems obvious that these things aren’t true because we know we have a better way to study them. If everyone who believed in those ideas had refused to change their minds based on the most recent evidence, science and human knowledge would not have been able to progress. This is similar to the debate about vaccines and autism–people once had some (now debunked) evidence that vaccines caused autism. However, scientists have shown why that data was incorrect-the lead author on that study actually falsified this evidence–and have done many many follow up studies showing that there is no link between vaccines and autism. This link is not just something that scientists haven’t looked for–this is something that many people have spent a lot of time looking for (using methods that we know should be able to find a link) and have shown to be very very unlikely to exist. But there are still people who are unwilling to change their minds in the face of this data. This is the same as the debate about climate change. During the industrial revolution, there was discussion about anything from volcanoes to humans being able to cause climate change. Now most of the evidence points to humans playing a role. Should we ignore that evidence because people have been arguing for a long time that volcanoes can also cause climate change? We are held back in making climate change policy by people who are unwilling to change their minds in the face of new data. And now back to the newly discovered brain-lymphatic system connection–this is something people didn’t notice, or didn’t have the right tools to detect. There was a lot of fuzzy, unclear evidence, and people knew that there was communication between the brain and lymph nodes, but were actively looking for how that happened. Science knew that we didn’t have the whole story yet. And now that we have another piece of the puzzle, everyone has accepted this new finding because they know that now we have data that can actually answer the question we’re trying to ask. And again, we move forward because people are not wedded to their ideas. We think science works both in trying its best to identify what is unknown and in correcting its mistakes. The lymph system is a perfect example of both of these points–scientists identified that we did not know exactly how the brain communicated with the lymphatic system, and then they showed how it did–in a way that countered several popular theories at the time, but was still widely accepted. Fortunately, scientific textbooks are constantly rewritten. That’s what science does – it investigates, and tests assumptions. Thousands of scientists are busy doing this right now, and will continue to do it. There’s no surprise that new things are learned! We know that we only know the tip of the iceberg and continually reexamine what we think we know, as we gain new ways of investigating. Look at how much more genetics explains and rewrites on a daily basis. Immunology textbooks are rewritten at a steady pace as research and knowledge progress. What’s the latest one you read? I have biology textbooks from when I first went to college and I enjoy comparing them to more recent college biology texts. In order to teach science, I have to continue updating my information and it’s a joy to do it. there are quite a few studies linking autism to vaccine adjuvants. and dr. wakefields article was redacted due to a false article written to debunk it and that article has been debunked already yet still dr. wakefields paper hasnt been reinstated because the minute it becomes fact it will bankrupt the trust fund for the vaccine injury compensation program. open your eyes and dont believe there was only one study linking autism to vaccines. and personally i know quite a few people whose children were perfectly normal before being vaccinated and within hours of vaccination it was like the lights went out and they were never to smile, laugh, or show any emotion since. and now they are diagnosed autistic…… so seeing it first hand you can not tell me there is no connection. also, there has NEVER been a double blind placebo third party verified study without adjuvants done on any vaccine ever. all tests are done in house by the manufacturer amd expected to show true results and this was proven when the department of health and human services was just sued and forced to show records showing that they have never tested a single vaccine for safety since they were given full oversight after the vaccine act of 1986 was passed. and lets not forget the other major organ that they never take into consideration that most dont know about…. the interstitium. Andrew Wakefield’s paper was retracted due to widespread and systematic fraud. And as mentioned above, there is absolutely zero evidence linking autism to vaccines. Our article on vaccination (http://sitn.hms.harvard.edu/flash/2016/to-vaccinate-or-not-to-vaccinate-searching-for-a-verdict-in-the-vaccination-debate/) cites plenty of scientific evidence in concluding that vaccination is safe. If you disagree with those conclusions, please provide the appropriate support–extraordinary claims require extraordinary evidence. if vaccination is safe then can you please tell me why DEATH is listed as an adverse effect on every single one? also can you please show me an actual unbiased study NOT done by the manufacturer proving that vaccines are safe? said tests do not exist so good luck. as stated before, not a single safety test on vaccines has been done by a 3rd party source with a double blind placebo trial since 1986 and our department of health and human services has admitted that in a recent lawsuit which i can also post if you would like. just look at the VAERS reporting system and read all the deaths documented to be caused by vaccines and then please tell me you consider them to be safe. also if they are so safe why is .75 cents from every dose placed into a trust fund to pay for injuries caused by them? i believe you are severely misinformed and are looking at tainted studies. please look at actual injuries done to children before telling me they are safe. i can prove they are not safe but can you prove that they are? It’s true that vaccines have caused adverse events, but these events are exceedingly rare (and serious ones like death are rarer still) and can often be linked to a pre-existing medical condition in the patient (https://www.ncbi.nlm.nih.gov/pmc/articles/PMC4599698/). If your definition of “safe” requires an absolutely zero chance of any side-effect then vaccines wouldn’t meet that bar, but neither would any medical intervention (or human behavior, for that matter). I would argue that that’s an unworkable and unrealistic standard. Working from a more reasonable definition of safety, there are many, many well-respected and unbiased studies that have deemed vaccines safe. Feel free to check out the 5 papers suggested here by the CDC (https://www.cdc.gov/vaccines/hcp/patient-ed/conversations/downloads/vacsafe-mmr-color-office.pdf). The Institute of Medicine has reviewed over 1,000 research articles and has come to similar conclusions (http://www8.nationalacademies.org/onpinews/newsitem.aspx?RecordID=13164). And it’s misleading to imply that safety tests are no longer performed on vaccines. Just like all drugs, vaccines must be tested in human clinical trials before they can be approved for sale on the market and widespread use. More information about that extensive and rigorous process can be found here: https://www.cdc.gov/vaccines/basics/test-approve.html. VAERS data can be useful but have some fundamental limitations. Among some of the problematic factors are that VAERS accepts reports from anybody, the data can be incomplete and/or incorrect, and it’s typically impossible to determine if the vaccine caused the event–remember that correlation does not imply causation. A full discussion of the pros and cons of VAERS can be found on the CDC’s website here: https://www.cdc.gov/vaccinesafety/ensuringsafety/monitoring/vaers/. Finally, I have some issues with the paper you cite. Not only does its lead author have a history of data manipulation and academic fraud (https://www.cbc.ca/news/canada/british-columbia/ubc-autsism-vaccine-paper-retraction-chris-shaw-1.4351855), but the paper itself had previously been retracted from a different journal due to “serious concerns regarding the scientific soundness of the article,” among other issues (https://retractionwatch.com/2016/10/24/retracted-paper-linking-hpv-vaccine-to-behavioral-issues-republished-after-revisions/). I could also discuss problems with its methodology and findings, but doing so wouldn’t be a productive use of anybody’s time. The CDC is bought and paid for. You figure it out.